I get emails all the time about film and “video” being released all the time. Sometimes I get an email that makes me feel soo old. This is one of them. An anniversary box-set. 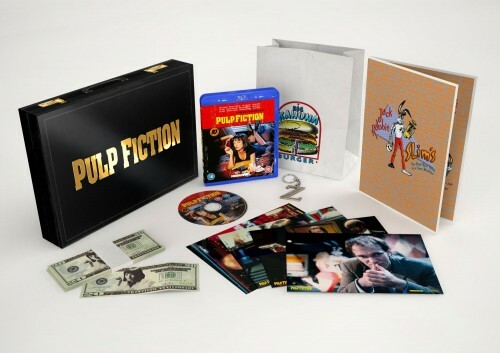 This time it’s the 20th for Pulp Fiction! This came out a couple of years before my adventures in film-land started but it is a film that stuck with me since I first saw it many years ago. A film that can, really, be watched in any order as long as the credits are in the correct place! I have heard stories from people I know who work in, and own, cinemas that there have been times that the last place the film was shown at, the projectionist miss-named the reels. This meant that when it arrived, the film was in the “wrong order”. Everyone who I have heard this story from have also said that “nobody complained or noticed [this mistake]“. The contents of this wonderful box-set can be seen below. Not only the film remastered in glorious 1080p but with a stack of extra pieces from the film. From a menu to a key-ring and quite a lot in between. The film that cemented Tarantino as a director. Also, in a way, changed how we looked at characters in film. We didn’t think of them having a personality or a “home life” away from what we see them in film as more of a stereotype. With the news of the amazing box set [ you can find all the details at the bottom of this post ] we have also been sent over a ton of images from the film. Including some behind-the-scenes images! Pulp Fiction is an inside look at a unforgettable community of LA criminals. Prizefighter Butch Coolidge has decided to stop payment on a deal he’s made with the devil. Honey Bunny and Pumpkin are a couple of young lovers and small time thieves who decide they need a change of venue. Meanwhile, two career criminals, Vincent Vega and Jules, go about their daily business of shooting up other crooks who are late on payments to their boss. While one is asked to babysit their boss’ dangerously pretty young wife, the other suddenly realizes that he must give up his life of crime.